Did you know that yellow is the most common flower color in the plant world? Its prowess at attracting particular pollinators is second to none. Thousands of species of bees, wasps, butterflies, beetles, and flies source nectar from yellow blooms, and thankfully, there seems to be no shortage of attractive, yellow-flowering plants for our gardening palettes. In my own garden, I grow no less than two dozen species of plants graced with yellow blooms. From early season Golden Alexanders to fall blooming Helianthus, my garden is always filled with floral sunshine! 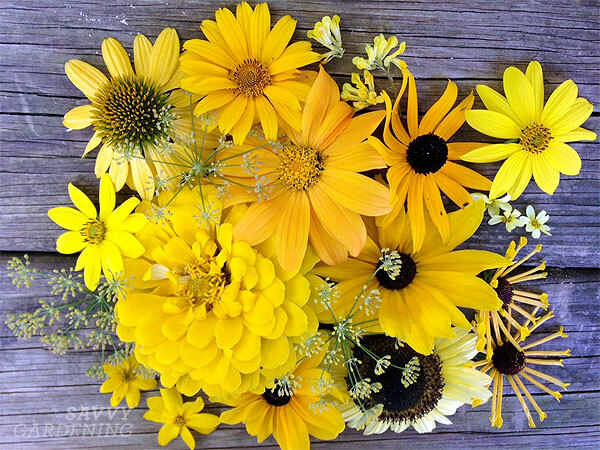 Here are some of today’s favorites: (from top left, moving clockwise) Echinacea ‘Sombrero Lemon’, Heliopsis, Corydalis lutea, Rudbeckia fulgida, Helianthus divaricatus, Coreopsis ‘Moonbeam’, R. hirta, R. subtomentosa ‘Henry Eilers’, Helianthus annuus ‘Lemon Queen’, Zinnia, Coreopsis ‘Zagreb’, bronze fennel, and at center, Tithonia ‘Yellow Torch’.